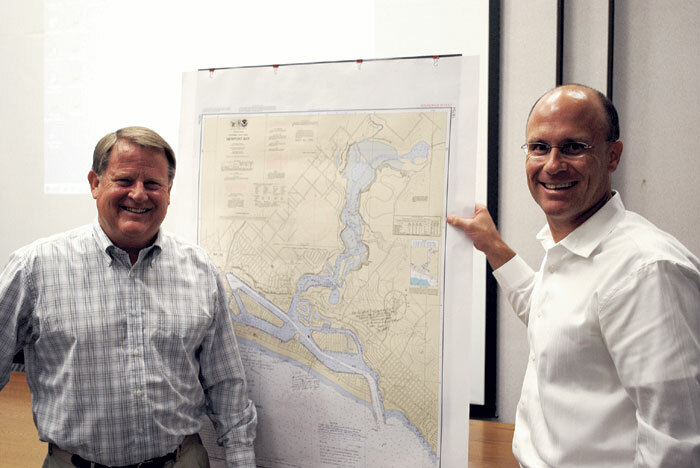 NEWPORT BEACH — After 10 years serving on the Newport Beach Harbor Commission, Duffy Electric Boat innovator Marshall “Duffy” Duffield is stepping down, having attended his last commission meeting June 13. The Newport Beach entrepreneur was presented with an NOAA-approved chart of Newport Harbor’s adjusted mooring field — an issue he worked on for years during his time on the commission. Duffield was also presented with the Harbor Commission’s “Golden Cleat,” acknowledging his 10 years of service. Harbor Resources manager Chris Miller gave Duffield a sample of sediment from the Newport Harbor Lower Bay dredging project, as well. “It’s clean, don’t worry,” Miller said, after Duffield joked about the sample possibly containing contaminated material. With his newfound free time, Duffield has big plans, many of which include projects for the betterment of Newport Beach. The Log caught up with Duffield after his final meeting, to see what was in store for the electric boat pioneer. The Log: How long have you lived in Newport? When did you start Duffy Boats? “I converted our family’s 20-foot inboard gas bay boat to electric in 1968, but I didn’t think anyone would buy one. Did you feel your experiences and background in Newport Beach and on the water helped during your time on the commission? What has the past 10 years on the Harbor Commission taught you? What are you most proud of accomplishing during your time on the commission? “I wish I could have done more, but government works at a snail’s pace. Running the Mooring Master Plan Subcommittee with so many hard-working volunteers and, ultimately, getting approval from the Coast Guard in Washington D.C. a couple weeks ago was big. We saved the city hundreds of thousands, and ended up with mooring fields that work well for all the users of the harbor. What was your biggest struggle on the commission? “Zoning was number one. One of the specific tasks assigned to the commission is to advise the Planning Commission and the Newport Beach City Council on land use and property development applicants to implement the goals, objectives and policies of the harbor and bay element of the General Plan. Sadly, I cannot say over the last 10 years waterfront development followed the intent of this document or of its latest revised version, called the HAMP (Harbor Area Management Plan). “We have very limited commercial waterfront property left on our bayfront for water-dependent, water-related and water enhanced uses and activities. The objective set forth by these documents was to enhance and provide landside opportunities for these marine-related uses — and, instead, we weren’t able to accomplish any of this. Bottom line is, waterfront property is economically driven and the highest return is not from recreational, marine or commercial uses. What do you think the commission should focus on, moving forward? “I would like to see the commission be more involved with the costs of running the harbor. Things like dredging and harbor-related issues are very specialized. I think it’s too much for city staff in the planning and building departments to pile onto their workload. What advice do you have for incoming commissioners? “Do research and study on your own. Staff is spread thin. Let them do what they do. “Get active on budget line items related to the harbor with the city manager, and advise the council on this. “Don’t do anything without first getting approval from the city council. “Continue to contribute good creative agenda items and think outside the box. “Finally released from the wrath of the Brown Act, I want to implement ideas I’ve had for years. I have a wonderful solution for a Harbor Patrol boat that would cut down on pollution, reduce operating costs and eliminate the damaging wakes produced at high speeds. (And) I want to provide a safer, easier method for using the moorings.